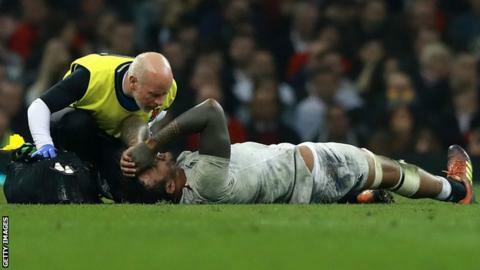 England lock Courtney Lawes has been ruled out of the remainder of the Six Nations after suffering a calf strain in Saturday's defeat against Wales. Northampton's Lawes, 30, had an MRI scan on Sunday and is expected to be out for at least four weeks. He was replaced in the closing stages in Cardiff on Saturday and had to be helped from the field. England's 21-13 defeat, their first in this year's tournament, leaves them in second place, behind Wales. Their next match is at home to Italy on 9 March. Lawes, who made his international debut in 2009, will return to his club to begin his rehabilitation.